In level 1 we dealt with 1 octave scales. C major, G major and F major. 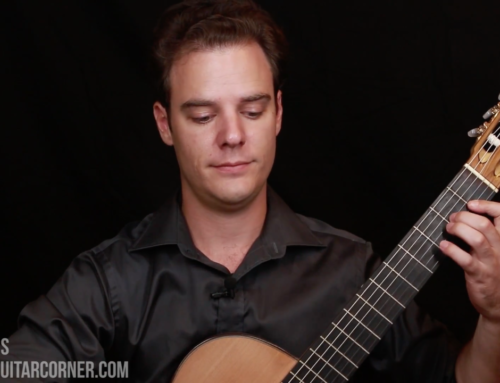 In this lesson we will look at two octave scales, chromatic scales and some new key centers. By branching out to two octaves we start to engage more strings and we will also start to use shifts in the scale. These two factors add some complexity and extra challenges as well as exploring more of the fingerboard. To start with, let’s have a look at G major in two octaves. This scale is nice because it stays down in first position for the entire two octaves and spans all six strings. F major shares a very similar range as the G major two octave, but it uses a Bb in the key signature. F major is the first of the “flat” keys. Now we can have a go at tackling the C major two octave scale. In level 1 we looked at the C major extended scale that used all six strings but it did not get up to the high C which lives on the eighth fret, first string. To get there we are going to need to shift at some point and there are usually several different places to do this. For now we are going to shift on the third string. It keeps the hand nice and balanced and it allow for a full octave to be played in fifth position. The chromatic scale incorporates every single note that we have in the western musical scale. Twelve unique pitches that are used to make up all of the music that we play. Quite incredible really. On the guitar this translates to a scale that is very comprehensive in the left hand. Starting with E on the 6th string we crawl up the chromatic scale in first position starting with the open string and then placing down fingers 1, 2, 3, and 4 in sequence. We continued in this fashion up to the first string with one exception, which is the third string that only uses finger 1, 2, and 3 (the fourth finger would be playing a B on the fourth fret but that is the same note as the open 2nd string). Once we reach G# on the fourth fret of the 1st string we have to shift up to fifth position to continue the climb up the first string. One last shift from C natural to C# on the ninth fret allows us to reach the high E on the twelfth fret. As we descend this scale we follow the same steps but in reverse. As you will feel in your left hand this scale give as a great workout to the left hand and it also opens up a lot of possibilities for the right hand to use interesting alternations and articulations. Download your free Daily Scales book here.